Despite the impression given by countless Saturday afternoon war films, the Second World War and Hitler's dictatorship was ended by the Russian army. The Soviet Union lost around 24 million people in the war - military and civilian. The war was brutal and the revenge upon the lands captured by the Soviet army was violent. Theodor Plievier's book deserves a much wider reading. He himself was an interesting man - he was a leading figure in the uprising by German sailors in Kiel that sparked the German Revolution of 1918/9. This revolution toppled the Kaiser and brought World War I to an end. His politics seem to have been very left wing, and the rise of Hitler led him to flee to Russia, which he eventually became disillusioned with. He fled again to the West and lived out his days in Switzerland. His book on Berlin captures the violence that was the end of the Third Reich. It is almost impossible to imagine the brutality that was imposed on the people of Germany. In the novel, many of them seem unable to comprehend what was happening, but most hadn't seen the slaughter at Stalingrad, the siege of Leningrad or the concentration camps. Plievier's book is clearly based on many true stories - many of the figures are historical. So the descriptions of those raped and murdered while holding out flowers for the Russian invaders read eerily true. The story certainly fits with the descriptions of other non-fiction books such as Antony Beevor's Berlin. For many, the most fascinating parts of the book are those that deal with Hitler and the people around him. As the Germany army retreats and collapses, the debates and arguments that take place in the bunker are fascinating. The belief even as Soviet troops entered the building that there was a relief army out there, preparing to stop the Russians was a fantasy that Hitler seemed to inspire in others. Many other figures appear - Albert Speer's character is accurately portrayed, though Plievier has an interesting style of rarely mentioning historical people by name. There are minor errors (Speer's pilot back into Berlin as he sought absolution from Hitler was a woman, not a man as Plievier tells us). There isn't really a central character to this novel. There are men and a few women who come and go. Their rise and fall fits with the rise and fall of the city, but some linger and as we follow various characters through the last days of the war, the post war order begins to fall into place. Germany is to be picked clean, it's industry and often its man power removed back to Russia to help rebuild the economy. The new government is put in place, men are selected and though they hold dreams of rebuilding a democracy out of the ashes of the war, they rapidly find that they are pawns in a larger game. The division of Germany in the interest of the other powers has begun. Rather startlingly, the book ends with a historic event that few may know of. The East German workers uprising in 1953 was the first time that large numbers of working people in that outpost of Russian State Capitalism rose up against a state that claimed to rule in their name. The brutal suppression is well described. 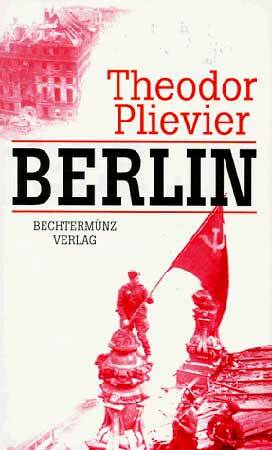 Modern Berlin's long story, that begins with the events that Plievier himself took part in in 1919 still had a long way to go - and Plievier captures the tragedy at its heart. The defeat of the British in Afghanistan in 1842 had far reaching implications. It caused shock at home - the political classes and the British population was used to seeing themselves as an invincible civilising force. The news of the disaster took several months to reach home, when it did, the information that around 17,000 soldiers and camp followers died, many in the most miserable of conditions was almost unbelievable. The defeat was a huge shock to those back home, yet it also had a effect of the millions of people living under British Rule - for once the British had been defeated and as Patrick Macrory says in his prologue, "the realisation that the British could...be beaten was to smoulder in secret in many an Indian breast for another fifteen years until, with the Great Bengal Mutiny, it burst into angry flames". Patrick Macrory's book isn't a history from below. Nor is it a particularly critical account of British Imperialism and the experience of colonialism. 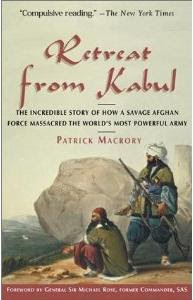 Macrory was very much an establishment historian, yet his work is an honest account of the reasons for the failure of the First Afghan War. The army that entered Kabul to prop up a British selected ruler was doing what the British had done many times before in India - the build up and support one side in an internal conflict, in order to rule by proxy. Yet the truth was that Kabul wasn't in India. It's great distance from the larger British garrisons, the inhospitable terrain and the unpredictable weather were always going to make a military occupation difficult. The Afghan tribes were not the uncivilised people that the British imagined they were. Indeed, they had, through a series of wars with their neighbours build up a very well trained army. The British were also to learn the hard way, that European strategies and tactics didn't always fit. "The Afghan jezil, with its long rifled barrel, far out-ranged the British musket and was much more accurate.... More-over, the Afghans fought intelligently. Not for them the thing red line or the British square, standing in full view of the enemy weapons and firing from the upright position. They took advantage of natural cover and 'until they commenced firing not a man was known to be there.'.... They were 'marksmen who seldom missed their aim' and, what was more, 'they appeared to pick off the officers in particular'." One soldier commented that "our infantry soldiers... might have taken a salutary lesson from the Afghans... our men seemed to fire entirely at random, without any aim at all". Racist assumptions of European supremacy were not for the first time going to catch British military leaders out. But the drive into Afghanistan was one that was in many senses doomed to failure anyway. The particular tragedy of 1842, was that bureaucratic failings, stupid leadership (and I use the word deliberately) as well as tactical ineptitude accelerated the process so that at every stage the British made the worst possible choices. The victims weren't simply the soldiers. Alongside the regular troops were many Indian men whose "native" regiments were seen as secondary to the European troops. When the retreat came, these men, despite years of loyalty were literary left by the roadside, forgotten and ignored. To encourage the idea that the British occupation would last for years, these men were encouraged to bring their families. Accounts of the retreat from Kabul, include several of European officers having slight twinges of regret at the sight of young Indian children freezing to death. Interestingly, Macrory brings out another problem with British rule - aside from the colonial arrogance that they governed with, they seemed unable or unwilling to understand the needs of a garrison in Afghanistan. Not only did they take their fox hounds, but they carried little enough food. Barely surviving the march into Kabul, the garrison quickly made sure the officers had enough entertainment and good food brought in from India. Dining on fine wines and delicacies shipped from the British Isles, playing cricket and organising horse racing, Imperial arrogance must have rubbed Afghan people rapidly up the wrong way. But the tactical stupidity is what really stands out. Readers who know little enough about siege warfare, will realise that storing all your food outside of the well defended garrison will mean problems in the event of any uprising. When the uprising starts, telling your troops to conserve ammunition despite having 12 months supply doesn't led to a demoralised enemy. Refusing to attempt to storm the well-stocked, easily defendable city a few miles away, and instead trying to march 20,000 through heavy snow over some of the most dangerous mountain routes in the world is insanity. William Elphinestone, who commanded the Kabul garrison was on paper an ideal leader. He'd fought honorably at Waterloo yet was now a very ill, old man incapable of decisions. Much of the individual blame lies at his door, yet the appalling bureaucratic nature of the British Army meant that initiative from below was stifled. "Eyre's wife, who had only one gown tried to borrow another from a lady who had trunks full, only to be rebuffed by the answer that she could not spare any. Mrs Eyre was also short of needles and persuaded Mackenzie to try to wheedle one or two out of Lady Sale... He never exercised greater diplomacy in his life, he said later, but he failed." Such are the bonds of class that must rule even in the deepest dungeon. Interestingly, Mackenzie was so traumatised by this that for the rest of his life, he "could not resist picking up every needle or pin that he saw". When news of the disaster reached India, and thence Britain, retribution was furious and swift. Kabul was recaptured from the rebels, and much of it was razed to the ground. The British didn't stay though, the Afghan people had stopped the permanent occupation. It is of course impossible to read this book without noting the similarities with more recent events in Afghanistan. Then, as now, the occupying forces are unwanted by the majority of the Afghan people and they are finding that modern methods of fighting don't necessarily translate to the terrain that is being fought over. Problems of supply and unsuitable equipment once again raise their heads. Though I doubt that the current British garrison's have tried to bring a pack of fox hounds with them. But at root there is the same problem today as there was in the 1840s. Then, Britain occupied out of fear of a Russian threat to India. They saw the rest of the world as a place to be used in the interests of British imperialism. After the war a more level headed member of the British establishment said that he had no "intention of making war for the sake of promoting the study of Adam Smith among the Afghans". Today, the occupation of Afghanistan too has little point other than the furthering the interests of a section of the US and British ruling classes. The thousands of men and women who perished in the Afghan snows almost 170 years ago, would have recognised the stupidity of what is being done there today. Perhaps they would also be surprised that few, if any lessons seem to have been learnt. For those interested in the Flashman novels, this work forms the basis for much of the story in the first in that series. The book's more recent title is "Retreat from Kabul: The Catastrophic British Defeat in Afghanistan, 1842"
This little book by Engels packs a hard punch. It is, in a few short pages, both a summary and a detailed explanation of the basics of Marxist ideas. It starts with the development of capitalism - the way that capitalism develops out of the old feudal order, bringing with it both a new way of organising production, but also it's own gravedigger. Alongside this Engels examines the way that ideas change - rooted as they are in the material circumstances that people live in, the development of capitalism means that the old ways of looking at the universe no longer fit. In particular, Engels looks at the Utopian socialists, thinkers who believed that rational thought and organisation would be enough to solve the twin problems of capitalism - "the class antagonisms prevailing in modern society between proprietors and non-proprietors, between capitalists and wage workers, and on the other, of the anarchy ruling in production". But Engels shows how these problems aren't simply about the organisation of capitalism, they are endemic. And despite the well-meaning and idealistic visions of many early socialist thinkers, "modern socialism" is about the struggle for a new way of organising society - a higher order. At the time of publication, Engels' short book was more popular than the Communist Manifesto. It's an accessible work, designed and aimed at working men and women. Explaining everything from the origin of capitalist crisis to the role of the state as an instrument of oppression of one state by another it still has much to offer. One interesting part is the way that he looks at nationalisation as being a key aspect of later day capitalism - he uses this to challenge those who think that it is enough to nationalise industries to create a socialist society. In one footnote, he jokes that were this true, Fredrick William III would have been a socialist for his nationalisation of the brothels. And this is another aspect to this book - Engels' writing is full of humour and barbed jokes. Another important point is Engels' examination of the role of the state. In particular he shows how the state cannot simply be abolished, but must wither gradually away after the workers have defeated capitalism. For those who want an excellent introduction to the basic ideas of Marxism, this little book cannot be recommended enough, together with the Communist Manifesto, it is a good starting point. It is worth digging out a version that has the 1880 forward by Karl Marx (to the French Edition) and Engels' own introduction to the first English Edition of 1892 which puts the discussion into the context of the UK's own historical development, in particular with regard to the particular role that religion played on these isles. Ever since the Russian Revolution there have been attempts to discredit those who led the revolutionary movement as being monsters, only interested in power. These memories go some way to showing that the most important revolutionary socialist of the time, Lenin wasn't the power hungry, vicious revolutionary that some who would discredit the socialist movement would have us believe. 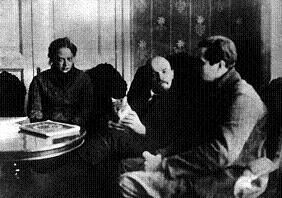 Krupskaya was Lenin's wife for almost two decades. More importantly, she was a leading Bolshevik organiser, including being secretary to the Central Committee at some of the most important points in that revolutionary organisation's history. Following the revolutionary, she played a key role in expanding and developing the educational organisation of the new, socialist society - something that had long held an interest for her. Those who would show the "human face" of Lenin, will find here much to help their project. One biography of the revolutionary leader was called "The Man Behind the Mask", with the idea that somehow he had a different public face to his real, monstrous interior. For someone who hated the way that Tsarism and capitalism restrained and limited human behaviour, it should come as no surprise that Lenin liked walks in the country, paintings and art of all types. He liked to hunt and explore. But it is not enough to show Lenin as an ordinary person in extraordinary times. What Krupskaya's memories show is a man absolutely dedicated to the revolutionary cause. Through years upon years of exile, the occasional imprisonment and countless difficult meetings, conferences and arguments, Lenin lost friends and made enemies. He rarely was able to see his closest families, but he was prepared to do this, because he understood that he had something to offer the revolutionary movement. There are omissions and problems with this book - as every memoir must have. It is a product not just of the times it describes, but also of the moment when it was written. By 1930, when Krupskaya wrote this book, Lenin had been dead some 6 years. Stalin had consolidated his power over Russia and had moved far from Lenin's strident internationalism, to his doctrine of socialism in one country. The liquidation of those who had lead the revolution by Stalin was proceeding apace, the most able leaders like Trotsky had fled the country or been murdered. This is reflected in Krupskaya's book. She cannot ignore reality completely - so Trotsky get's passing mention in the book, mostly to describe the moments when he is wrong. The book finishes however with the October revolution. Though there is no mention of the close collaboration between Lenin and Trotsky. Nor is there mention of Trotsky's central role in the civil war, even though passing reference is made to the events. It's possible that Krupskaya was fearful of confronting Stalin direct by this point. It's also possible she was writing for Stalin. There is nothing in here that can explain it either way. Those were difficult times for genuine socialists and Krupskaya may well have been hedging her bets - though she comes close to justifying Stalin's events when she singles out some quotes of Lenin's seemingly to support the idea of "Socialism in One Country". It is of interest though, that those who would portray Stalin as a great revolutionary leader will find little mention of his role in the early Bolshevik party here either. For those who have some knowledge of Russian Revolutionary history there is a lot in here that will be of interest. Particularly for those active on the revolutionary left now, the stories of life in an underground organisation, facing constant harassment and imprisonment are fascinating. Time and again, the author describes socialists who meet some bitter end, in exile, the gallows or prison. But if there is one thing that we learn, it is that a revolutionary group, with consistent ideas and activity, can influence and make a difference when the mass of workers move into action against a system that exploits and ruins them. "Buscot... is famous principally for having a church with no aisle.... The area was once well known for its brandy distilled from beetroot. The beverage was not popular." "There have been wherries and clinkers, hoys and onkers, houseboats and skiffs, yachts and motor-boats, tilt-boats and shallops..."
The history of the Thames is no less poetic. From the votive offerings thrown into the water near to crossing points and bridges. To the historic burial mounds and earthworks that line the shores. People have relied on the Thames for water, for transport and trade for hundreds of centuries. Many have left their mark, and the Thames has made it's mark on them. There are darker moments - the suicides and accidents, the poverty that marked the London shorelines for instance. And Ackroyd is selective in his history - despite the importance of the docks in shaping London and the Thames, there is nothing here of the great class battles that took place around them - the Dock Strikes of the 1880s that helped to shape a new Trade Unionism for the 20th Century. "In 1756 Stephen Duck, a country poet who became a target of ridicule, flung himself into the Thames behind the Black Inn at Reading; perhaps his surname had drawn him towards the river." But this aside, Ackroyd has written a lovely book that deserves to be read for its entertaining look at one of the most important rivers in the world.